Get out of town with these interesting Dallas side-trips: Hagerman National Wildlife Refuge (in Sherman), Glen Rose (Fossil Rim Wildlife Center & Dinosaur Valley State Park) and Atomic Candy (in Denton). Pack the 17th (Mon) with family-friendly diversions at Six Flags Over Texas. Spend the 18th (Tue) exploring nature at Arbor Hills Nature Preserve. Next up on the itinerary: admire the natural beauty at Dallas Arboretum & Botanical Gardens, see the interesting displays at The Sixth Floor Museum at Dealey Plaza, meet the residents at Fort Worth Zoo, and contemplate the long history of Fort Worth Stockyards National Historic District. To find where to stay, maps, ratings, and other tourist information, refer to the Dallas trip itinerary builder site . If you are flying in from Netherlands, the closest major airports are Dallas Fort Worth International Airport and Dallas Love Field. Expect a daytime high around 17°C in December, and nighttime lows around 5°C. Finish your sightseeing early on the 21st (Fri) so you can travel back home. 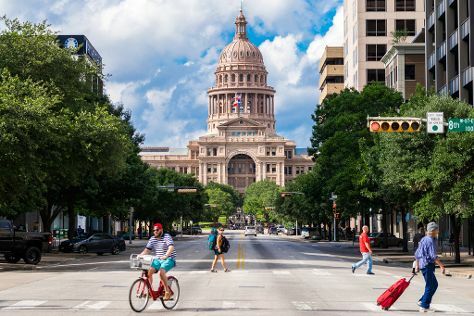 Start off your visit on the 22nd (Sat): take in the views from Congress Avenue Bridge / Austin Bats, then steep yourself in history at Texas State Capitol, and then stroll through Lady Bird Lake Hike-and-Bike Trail. Get ready for a full day of sightseeing on the next day: Head underground at Natural Bridge Caverns and then test your team's savvy at The Escape Game Austin. To see ratings, maps, photos, and other tourist information, refer to the Austin trip itinerary app . Traveling by bus from Dallas to Austin takes 3.5 hours. Alternatively, you can drive; or fly. In December, daily temperatures in Austin can reach 20°C, while at night they dip to 8°C. Wrap up your sightseeing by early afternoon on the 24th (Mon) to allow enough time to take a bus back home.